I think Mathias ment run ’file’ with LookYourLoot as argument. Ok, good. Yes, having two binaries (armv7+arm64) in one file is what I expected. Strange though, that the version I got out of my iPhone 7+ only had the armv7 in it, and that it was unstripped. Very awesome game, congrats ! This game is doing unspeakable things to my productivity… well done! As a bonus: there is NO ADs in this version. Ok, first results of test. 9k installs and 2 ANR. Perhaps, ANR: Broadcast of Intent android.intent.action.SCREEN_OFF depends from VideoADs module. Waiting for more stats in console. First of all, what an amazing game. I’m having a lot of fun. It’s one of those games that stays with you. An instant classic. And that’s why I have a request (which I hope I can ask here). Is there any possibility to implement Google Play Games cloud save as an option, please ? I don’t have Facebook and it would be amazing to take my progress with me if I switch to a new phone. With games like this, this is so important to me. Keep up the great work on this amazing game ! 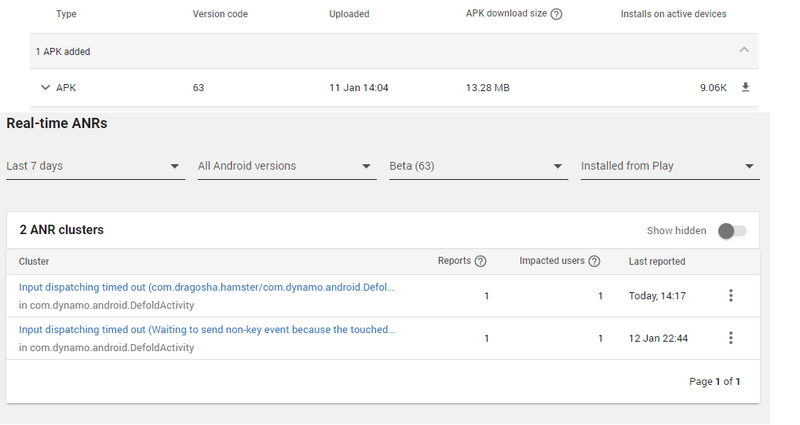 Defold currently doesn’t support Google Play Game Services, but it would be possible to create a native extension that adds this support. Anyone in the community with enough time on their hands should be able to do this. I had hoped to do it myself in November but I’m constantly held back by other things. The work has been started here: https://github.com/defold/extension-gpgs Anyone willing to pick it up and continue? I really hope someone can do this. What does this icon do ? And how do I reset it ? Ah, I see ! Thank you for clarifying ! I have two requests, if this is okay. First request. Is it possible to implement an ‘exit’ button in the main menu, to simply close the game ? The phones back button works, but is very irritating to use. I would need to swipe up to make the phones navigation bar to appear. And usually that will trigger one of the bottom buttons in the games main menu. This is very frustrating. Second request. Is it possible to close the game mid-game. And the next time I will start the game, i can continue where I left off ? Say you’re very far into one dungeon and you need to stop (because of a real life situation). It would be a shame to suicide or stop the current game. And I hope these features are possible to implement. Second request . Is it possible to close the game mid-game. And the next time I will start the game, i can continue where I left off ? Say you’re very far into one dungeon and you need to stop (because of a real life situation). It would be a shame to suicide or stop the current game. 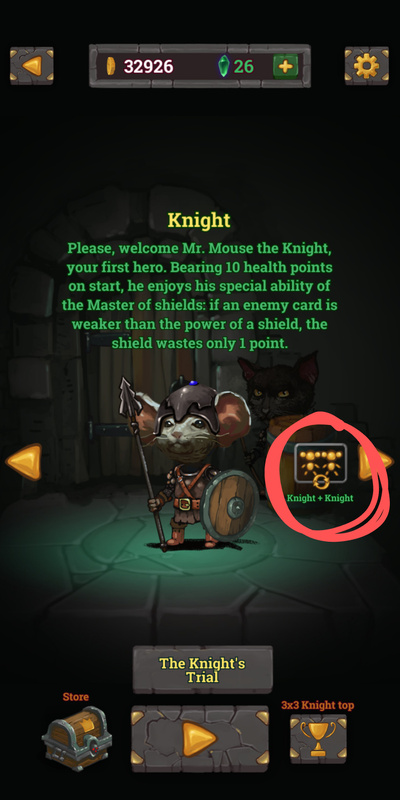 The game has autosave after each turn, so you can exit from app and back when you want. Just gotta say. This game won’t let me go. Jut recently started playing the 4x4 grid. It’s a total new challenge. Thank you for the Exit button. And I like he new icon too. The work has been started here: https://github.com/defold/extension-gpgs Anyone willing to pick it up and continue? At the character selection screen the head of the Paladin’s hammer looks kinda ready to fall off. The 3D effect is super neat, but the head seems to be moving independently from the shaft. In general I think achievements should be listed (very roughly) in the order of difficulty. I’ve completed 19 of 27 but only one out of the first four (the lockpicking one). After finishing a game, the two available icons feel switched. The curved arrow makes me think “return to menu” while I would expect the “play” button to take me back to the game immediately. It took me a while to figure them out and I still sometimes press the wrong one. The Assassin throws the dagger in strange places after using the Shift Mask. I mean, it probably makes sense, but it looks weird, especially when it flies diagonally. I think he should target the tile that was swapped by the Mask. Speaking of weird throws, I was playing the MIX mode and as the game switched to 5x5, I think he threw a dagger at a tile quite a ways from his location and hit a health potion. The first boss is still called “Boss”. Maybe it’s time to give him a name too? It would be nice if the game kept track of victories in specific game modes with specific characters. Finding a second revive with one already active is always quite a drag, but it also usually pushes me into a “suicide” so that I make the most of the powerup. Being forced to pick up a duplicate is, of course, a terrible feeling. I was thinking giving the player some amount of health for it would soften the blow a bit. Same with a duplicate key and gold (and hey, the key is golden, so it would make sense to be able to pawn off the duplicate). The ending screen shows gold collected but not gems. When confronted with a powerful enough enemy, the Assassin will stop throwing poisoned daggers at some point (I assume as the monster is already poisoned-up enough). He will still throw one at such monster after breaking a barrel or drinking poison. Speaking of breaking barrels - is it intentional that the Assassin throws daggers at ALL enemies next to him after breaking one? I don’t see the logic in it (unlike in the same happening after drinking poison) and as much as I enjoy the mechanic, especially when I manage to hit four monsters at once, so far the Assassin is the only class where I’d bet good money I’ll reach level 20 any day, so a nerf wouldn’t be out of place in my opinion. The Berserker’s healing triggers from being hurt by spike traps, but not from any other sources of out of combat damage. I’ll keep on making notes as I play and post an update when I have enough once again. In the meantime… I’ve noticed there are quite a few awkward turns of phrases or (what I think are) outright language errors, so I took the liberty of writing them out. But please note - I’m not a native English speaker, so it should be worth it to have someone else look at the list and check if these changes are really necessary. Maybe someone else will chime in. Additionally sometimes the difference between error and stylistic choice can be a tiny bit blurry, so keep that in mind. Treat these like suggestions rather than fixes. I made any changes or additions bold and took crossed out words I think should be removed. Text in italics are cases where I’m really not sure if I’m correct or where I feel it’s definitely a matter of taste rather than correctness. Oh, and I’m writing this on a wireless keyboard that’s due new batteries, so there’s probably a lot of missing letters on top of other mistakes that are only on me, so keep that in mind as well. (…) he enjoys his special ability of the Master of Shields: if an enemy card is weaker than his shield, the shield loses only 1 durability point. (…) only 9 health points and takes not damage if he fails to pick a lock on a chest. Notes: Maybe “Feared of light” is an intentionally archaic formulation? I think “Afeared of light” would perhaps be better. Also if we capitalised it, “seeking the Darkness” would imply some concrete thing of darkness that the Druid seeks (and make the indefinite article “the” fit in the sentence). (…) his lance hits one monster behind his target. (…) He loses some power with every non-combat move, but gains some after every fight. (…) one problem: he will keep all gold for himself. (…) Throws a poisoned knife at anyone following him. I think all the item names should be fully capitalised, even those that are not proper names of an artefact, i.e. Spell Book, though I’m not 100% sure on capitaisation rules in English. I know only that it’s much more trigger happy with them than my native Czech. There’s currently a few named items that are not properly capitalised as well, such as “The gauntlet of Boom”, so that should be fixed at least. Similarly spell and ability names are usually not fully capitalised, which I feel they should be. Also, when referred to in item text, they are usually (but not always) enclosed in quotes. I’d fully capitalise these (i.e. Bomb Rain) and get rid of the quotes, unless the text is referring to the card instead of the spell contained in it (so <Adds one bomb to the Bomb Rain spell> but <Chance to find the “Shift Mask” card>). The game consistently uses the world picklock as opposed to lockpick. I admit I’ve failed to find any source on this, but it was always my impression that the former is more commonly used in British English while lockpick is he American English version. If that is indeed the case, I’d suggest changing it, as the rest of the text is using American spellings (such as Armor instead of Armour) and while either is fine, you should be consistent. Then again, maybe “picklock” is normal in American English ¯\_(ツ)_¯. So I’d say keep it the way it is, unless someone else can confirm my theory. Spell book: Upgrades the Charge spell. Minerva Amulet: Gives a small chance to find the (…) inside barrels. Bunch of keys: (…) Take some keys! Equality pendant: **The Equality spell no longer affects your hero. Epic! (…) Does that sound boring? Yep! The Gauntlet of Boom: Increases the chance to find a bomb inside barrels. Salamander poison: Prolongs poison *duration by one turn. Four of the achievements are named, the rest only show the requirements. Just throwing this out here, but I feel like the names are somewhat out of place, though I believe it would be the best to come up with names for the rest of them as well (achivement names are always a good place for some creative worldplay!) and make the names distinct from the achievement text. It would probably require a bit of a redesign, unfortunately. 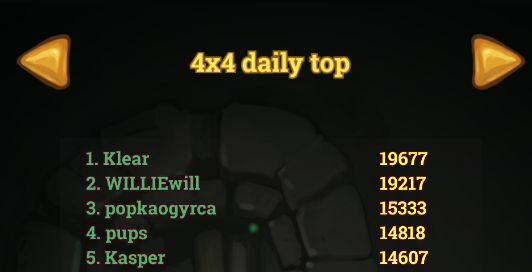 I assume the class leaderboards are for 3x3?